By (author) Yuri D. Fedoriw, MD, Parul Bhargava MD, Kyle T. Bradley, MD, et al. 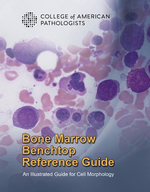 Bone Marrow Benchtop Reference Guide is an illustrated guide to common and rare cells. For students and medical technologists, it’s an affordable, convenient way to identify various cell types quickly and confidently. Its rugged construction is well suited for heavy use at the workbench. Includes more than than 60 different identifications and detailed descriptions for each cell morphology.